Community rallies for Black man executed in rural Florida county | Fight Back! 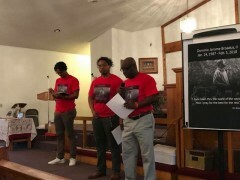 MacClenny, FL — On March 1, the family of DJ Broadus II, an African American man brutally murdered in north Florida, called for and rallied at a second town hall meeting here, at Emmanuel Church of God in Christ. About 80 people showed up to a town hall meeting which was led by Dominic Broadus Sr., the father of the slain Dominic “DJ” Broadus II. Participants included Michael Sampson II and Joshua Parks. Sampson and Parks are members of the Jacksonville Community Action Committee, a local Black-led organization that has been helping lead the effort to get #Justice4DJ, along with other organizations such as the Dream Defenders, Color of Change, and the Black community in MacClenny. MacClenny is on the western outskirts of Jacksonville. Broadus II was found murdered execution-style with three bullet wounds to his head on property that belongs to the Fraser family, a very powerful family in the MacClenny. Gardner Frazier, along with one other undisclosed person, were the only people on the property at the time of the murder and made the 911 call. Gardner Fraser, who was well known in MacClenny for his violent behavior, was terminated from North East Florida Hospital for breaking a patient’s jaw. Gardner Fraser is the son of a former Jacksonville Sheriff’s Office Deputy who was fired for shooting an unarmed Black man, and then hired by the Baker County Sheriff’s Office, where he eventually retired. Gardner Fraser is also the grandson of Edwin Fraser, who the MacClenny hospital is named after. Edwin Fraser served in the Florida State Senate and the Florida House of Representatives for several years between 1937 and 1963. At the townhall, community members chanted “Justice for DJ,” as well as “What do we want? Justice. When do we want it? Now!” Community members talked about their own experiences with the racist criminal justice system in the rural county with a population of just around 27,000. 1. Instruct the BCSO to make an immediate arrest and charge Gardner K. Fraser for the execution of Dominic Jerome Broadus II. 2. Release the State Medical Examiner's complete autopsy report to the family's independent pathologist so they can complete their analysis. 3. Explain why Gardner K. Fraser has been allowed to roam free for over three weeks without charges for DJ's murder. 4. Petition the FBI’s Public Corruption division to conduct an immediate investigation into Baker County Sheriff’s Office as it relates to procurement of evidence and nepotism within this law enforcement agency. On March 5, there will be a call-in day to State Attorney Bill Cervone of the 8th Judicial Circuit (at 904-259-3137) to demand an arrest for DJ’s murder and for the FBI to investigate BCSO for public corruption. The community will continue to rally and demand justice until these demands are met and justice is served for Dominic Jerome Broadus II.